Popping in to check out what sort of contemporary art offerings were on at the Ballarat Art Gallery today I was pleased to find a few really good artworks to take in. Unfortunately, David Rosetzky’s work in the window of Lydiard St, a couple of doors down from the entrance, is only visible at night so I missed out on that one, for now. The Ballarat Art Gallery is in a lovely old building, one of many majestic treasures on the streets of Ballarat, and has plenty of space to show its wares. There’s an awful lot of colonial art, as you’d expect in a town whose main claim to fame is the volume of gold that they harvested out from under it 150 years ago. At the moment there is also a pretty impressive selection of Modernist works from the canon of Australian art too, on loan from the Art Gallery of New South Wales. But there’s also plenty of contemporary fare to sink your teeth into. Today I sampled the print exhibition called ‘A Guiding Hand: prints and directors 1967-2011’ together with some works from the permanent collection. Given the date range of the print show there was only going to be a few truly contemporary works but they were great pieces. David Noonan’s Owl (2003) was particularly mesmerising, presented as a pair – with an artist’s counterproof on the left (in negative) and an editioned print on the right. Showing the pair of prints like this was highly effective for this particular work. 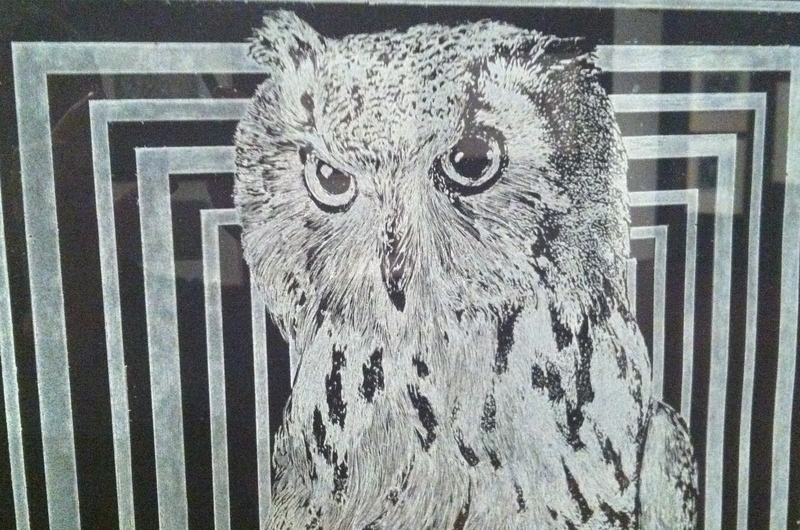 Depicting an image of an owl on a geometric patterned background, the print vibrated psychedelically with the contrasted balance of blacks and white. The intense stare of the owls focused inwardly between the two prints as if they were sentinels guarding rectangular portals into a gothic abyss. Another artist whose work is presented in a pairing is Deborah Klein. 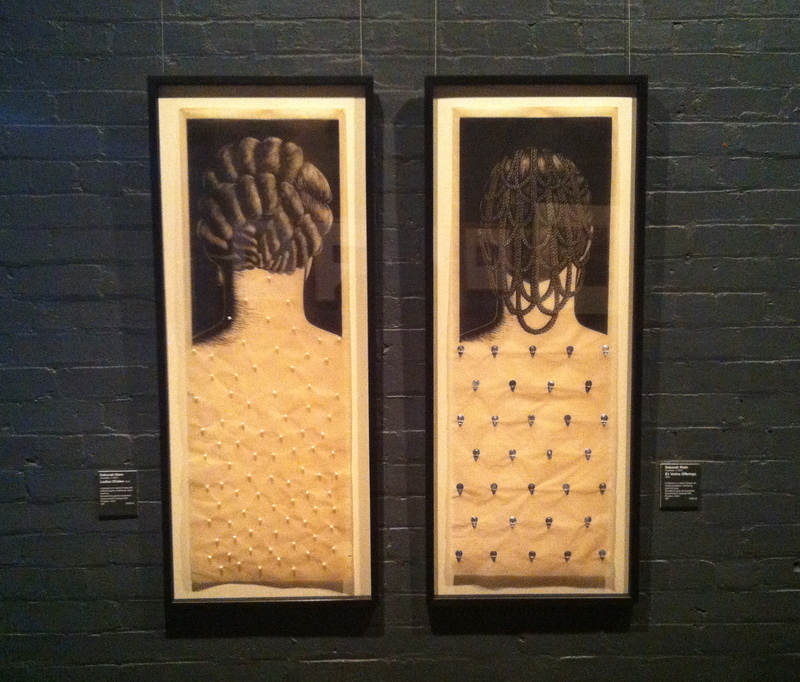 Her two screenprints on chinese silk each contained hand stitched sculptural additions. Both images showed a, presumably, female figure from behind with plaited hair and naked back. But into the silk, artificial pearls (in Ladies Glisten, 2002) and needle threaders (in Ex Votive Offerings, 2002) were hand sewn on the area of their naked bodies. Together with the extravagantly twisted and knotted hair, these decorative features spoke of an ornamentation of the body that blurred the boundaries of the body and its adornments. The organic quality of the soft silk registered as both skin and fabric, and with the figures facing away from the viewer the act of looking at the bodies and their features become more obviously a way of assessing and analysing another person’s physical presentation. It also highlighted the almost torturous lengths we go to in order to achieve such attention. Upstairs I took myself into the room devoted to the most recent Australian art and found a strong body of works to engage with. Firstly, Tony Cran’s painting We’ve come for what’s ours (2007) sat ominously on the wall. 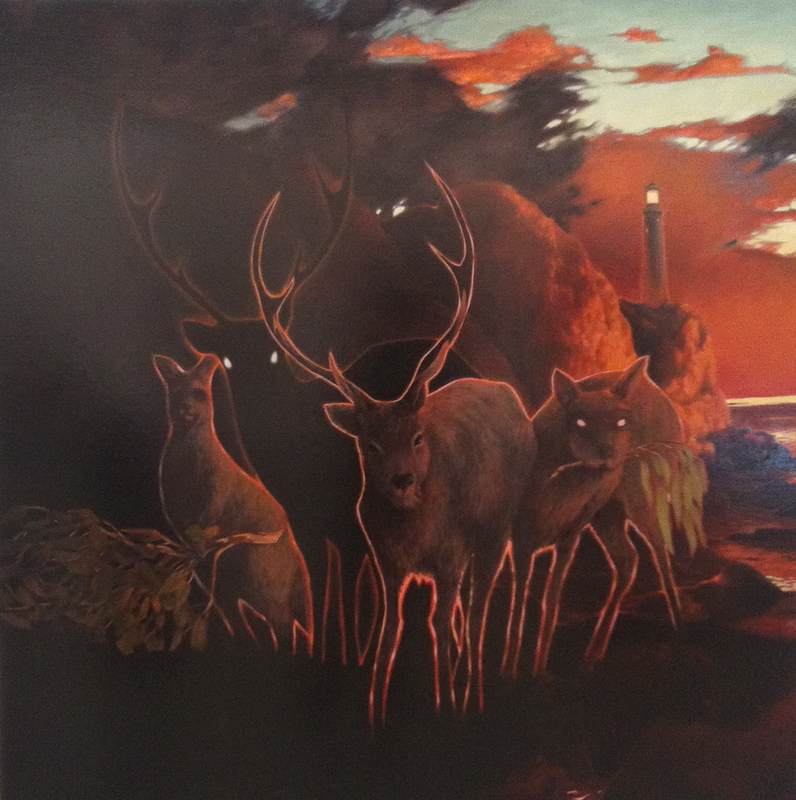 Its depiction of darkly glowing animals staring menacingly out from a stormy landscape was very magnetic. Underneath a blackened sky, a lighthouse poised with silent warning on a cliff, several deer (one with a bandit mask) and a kangaroo stood solidly, vacant eyes fixed straight ahead. Like zombies possessed they appeared eerily hesitant but relentlessly focussed. Occupying a landscape bordering land and sea they seemed to also hint at notions of the liminal (or in-between), perhaps even of patterns of migration aided by the combination of introduced and indigenous species. On the opposing wall a very different, but no less captivating, painting by Jon Cattapan called Marker (2010) shone in a luminescent green. This acidic green was like the green of night-vision goggles, and the figures that occupied the canvas were ghostly apparitions, enhancing that effect. 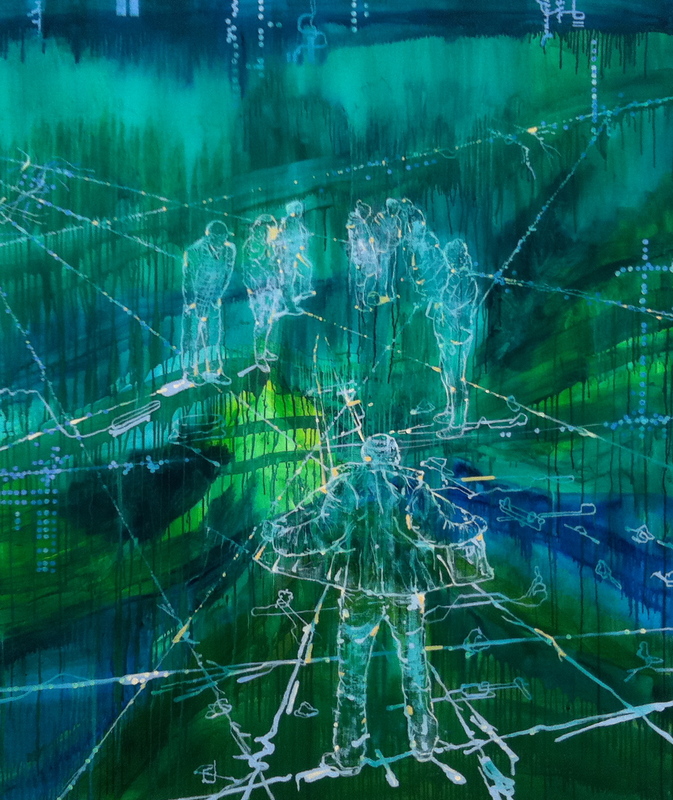 On a gridded field of lines and dots that brought to mind computer mapping and digital interfaces, the figures stood around as if bored, waiting for something to happen, while in the foreground one of the figures was holding his jacket open and showing his torso to the crowd. Seen from behind we can only imagine what he is showing but the stance is similar to a number of clandestine behaviours like flashing, displaying counterfeit goods for sale, or revealing a bomb strapped to your body. Given the sense of surveillance evoked by the manner of the painting, the latter seems the most likely, and then all the more disturbing for the lack of interest paid to him by the other figures. In the far corner I came across the work of Angeline Pwerle Ngala titled Bush Plum (2005). Completely abstract and a much more contemplative piece, this painting was, at its simplest, a set of white dots on a black background. But, belying that simplicity, was the intense complexity achieved by the accumulation of these dots, each one slightly different from its neighbour, like snowflakes or fingerprints. Collectively, the dots swirled into whirlpools, networks and constellations. Organic in a way that was somehow both geological and astronomical. The sort of work you could lose yourself in, happily surrendering into the vastness of time and the intricacies of the human endeavour. A small sculptural work also caught my attention. Mount Hesperus (2007) by James Morrison was a papier mache creation of fantastical flora and fauna, with intricately inked patterns covering every surface. 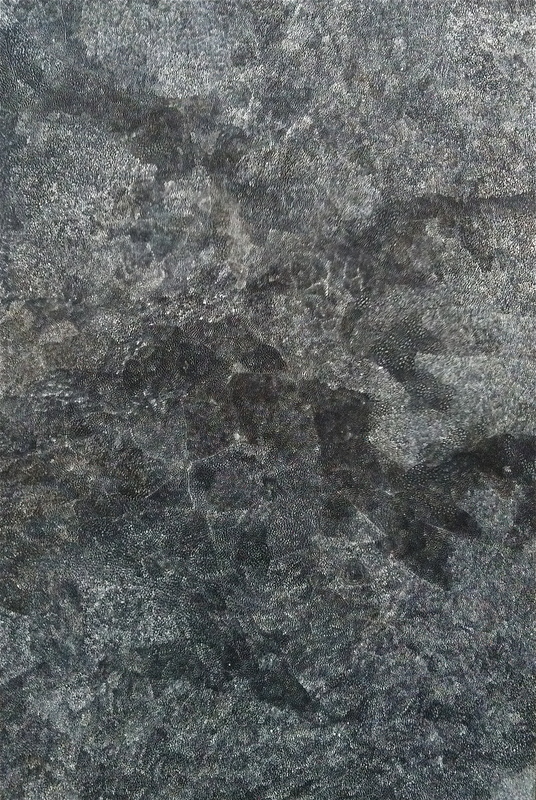 As if all coalescing from the same materials, the plants and animals jostled with each other for the light and for the opportunity to display their markings. Again, like the work of Ngala, the intensity of the energy and time invested in the mark making of the object gave the work a sort of gravitational power. All in all, the afternoon spent here was a great little drift through some magical works. The print show runs until 27 November, and if you happen to be going by at night, that’s the only time you’ll be able to see the David Rosetsky work, until 13 November. Tags: Art Gallery of Ballarat, David Noonan, Deborah Klein, James Morrison, Jon Cattapan, Pwerle Ngala, review, Tony Cran. Bookmark the permalink.